Objective: Krismas Mahjong is a Christmas Version of Kris Mahjong. A very popular Mahjong game. Connect the mahjong pieces in KrisMas Mahjong. Clear the board by removing all pairs of identical tiles. 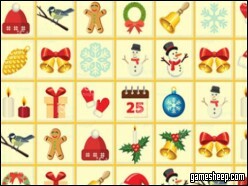 We are glad that you have chosen to play Krismas Mahjong on GameSheep.com, the most dynamic website available. If you like this game Krismas Mahjong don't forget to rate it and this way you will help with selecting only the best games for the home page.